Clark's work focuses on deteriorating architecture. These structures, designed to be huge forces of permanence, are continually being challenged, destroyed and forgotten. He sees an inherent honesty in the face of his subject. Among all of the clutter—the shards of wood and layers of rubble—there remains a gentle resolve. As he works, Clark studies these structures incessantly. The buildings, often on the brink of ruin, have something very energized and present trying to escape from their fragmented reality. These images are created through an ambitious layering process. 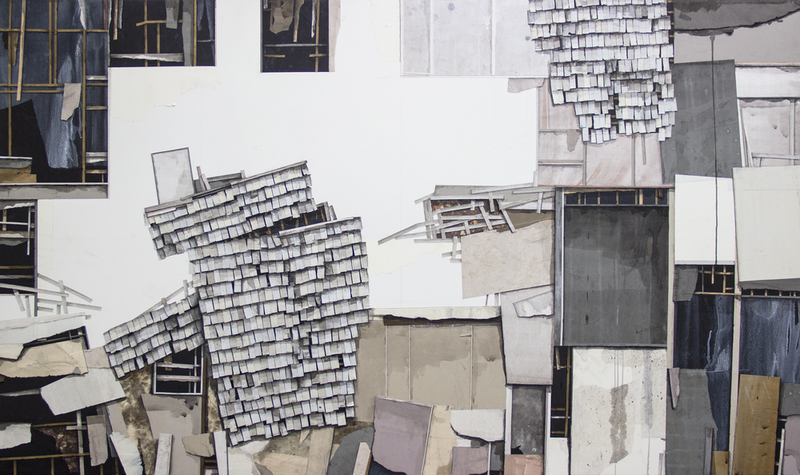 Clark collages with found paper to reflect the fragmented and complex tactility of decay. Once a dimensional foundation is achieved, various mixed media are used to bring definition and depth to these raw materials. The processes of collage and drawing alternate between themselves lending to a seamless blend of the two mediums.